3 Bedroom Cosalt Eclipse Gold Plus Caravan situated on the sort after Poplars area, just a few minutes walk to the Butlins main facilities. I didn't stay in this one but the 4 people who did enjoyed thoroughly. everything they needed and more comfort clean and spacious. The caravan was one of the best caravans i have ever stayed in, it had with everything you need,my only criticism is i purchased the W.F.I, so our daughter and 2 Granddaughters could use their I-pads and i could use my laptop, but sadly the connections to the I-pads and my laptop didn't work, and connection to the phone was very slow, apart from that we had an excellent weeks holiday enjoyed by all. My daughter stayed in this caravan for a weeks stay with her family and it was Lovely, we have been holidaying at the caravan village for many years now but this is our first with Willis holidays but will not be our last. Beth is very nice and its obvious she takes great care of her holidays homes, very clean and well looked after. My daughter and family had a great time. We have just returned from a weeks holiday at Butlins Skegness. There was myself and my husband and our three kids. We couldnt fault the caravan, it was one of the best we have stayed in, it was clean, comfortable and value for money. It was just a short walk from the entertainment. We had a great holiday and will definately be booking with you again. 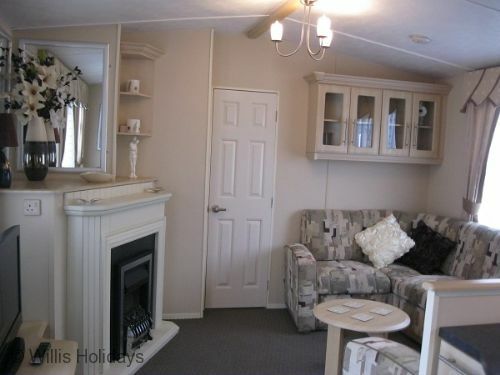 Lovely caravan have used Willis holidays before and would use again. We had no problems either time getting our deposit back, but we did respect the caravan and left it as found. This is the 3rd time that I have stayed in one of Willis holiday caravans, but the first time in poplars 24. Location superb and everything about the caravan was lovely. * We paid £25 for the linen package for the first time, to save us bringing our own duvet covers and putting them on. However when we got there a bag of linen was sat on the table in a bag. We thought that if we were paying for a linen package that we wouldn't be putting the linen on still! We were a little bit disappointed at that. * The location of this caravan is spot on, a 2 minute walk from the marquee meaning that we felt comfortable walking back on our own if we felt like we needed to. Lovely caravan clean comfortable great condition and fabulous location. We would recommend 100%. Already booked for next Butlins weekend in November. Fantastic caravan, so close to tunnel and tent, Excellent for walking there. Loved it apart from the horrendous weather!! The caravan was extremely well presented and very clean. My daughter was so impressed she is going to use a caravan holiday in future rather than a butlins chalet. Our van was very well positioned within the site and it took only a few minutes to walk into the heart of butlins. Everything you need for a home from home experience was available. Overall a great short break for the Easter weekend. My friends stayed in this van and confirmed that they would have no hesitation in recommending. Nothing too much trouble. The van is beautifully furnished and very comfortable. No complaints whatsoever. The caravan was lovely with a good location. However, there was blood on the bedding from a previous guest. The cushions on the sofa were dirty with marks from food and drink off a previous guest. Curtains also had dirty marks from a previous guest. Lamps in the living room did not work with no spare bulbs. I expect more from a gold plus caravan. DThe caravan was good,we did expect more age equivalent entertainment on Butlins site. We found the restaurants over price which we had no alternative but to go of site to eat. We have stayed in this caravan now on three occasions and would recommend it for comfort cleanliness and accessibility to the main attractions. Beth of Willis Holidays is very friendly and professional and any problems are sorted out immediately. Excellent position clean and comfortable and lovely and warm on a cold weekend in November. Excellent service from Beth at Willis Holidays as always. Will keep on booking. I was delighted with the caravan - it was lovely and clean and very close to all of the amenities. Willis Holidays are always very easy to book through and very helpful. Overall a great caravan in an excellent location, I think we were spoiled by last years choice ( no 2 Dunes) the beds are a bit uncomfortable and there was a tiny issue with a smell in one of the bedrooms, however, apart from having to scrub the kitchen sink on arrival as there was greasy washing up water in it, we had a very good time. Our top tip would be take oven gloves and a tin opener as neither are currently supplied. Would book this caravan again, Willis holidays have been our choice for two years! From arrival to departure, our 2nd stay with Willis Holidays was as great as ever. Good comfortable clean accommodation and great value for money. We will certainly be back to book again. We stayed here for 7 nights and was very pleased with the accommodation. Plenty of room in the double bedroom and a lovely big shower in the on-suite. Nice size TV in the lounge area and full size fridge and full size freezer in the kitchen. Our only gripe would be that it is possibly time for a bit of TLC as there were lots of dents in the furniture and also perhaps different covering on the windows as the nets were a bit of a nuisance when the patio door was open. The BIG plus was getting the key at 2pm, it made all the difference. Our £50.00 deposit was back in our bank the same day we left along with a thank you from Willis. Will definitely use them again and would have no problem recommending them also. Nice and close to butlins for the adult weekends no wandering around the caravan park getting lost! Always clean and has all essentials lots of vans don't like cleaning products and hand soap! I would highly recommend booking your holiday with willis holidays. Beth was very helpful and always available when I called, although the cost was quite high as it was a themed weekend the fees for other times are very reasonable. Poplars 24 is an ideal van for people who need a little privacy as the bedrooms are either end of the caravan and not all together, they also have a bathroom at each end. Willis holidays have a few vans like this. I had the opportunity to view some of their other gold plus caravans during my stay and would be happy to stay in any of them i can highly recommend dunes 74 it's beautiful. I have already booked 2 caravan for next September with willis holidays.